Time: 30 minutes. Here's a simple yet satisfying way to get more vegetables into your day. Feel free to experiment, changing up the vegetables you use based on what's in season, as well as the bread. Tortillas make good wraps, and the fillings are excellent in pita bread. In a small bowl, combine yogurt, herbs, and salt; set aside. In a medium bowl, combine carrots, cucumber, red onion, and cooked peas. Lay 1 sheet lavash on a work surface with a long edge parallel to the table. Spoon about 1/4 of yogurt mixture lengthwise down the center of lavash. Lay 1/4 of tomatoes over yogurt, then arrange about 1/4 of carrot mixture over tomatoes. 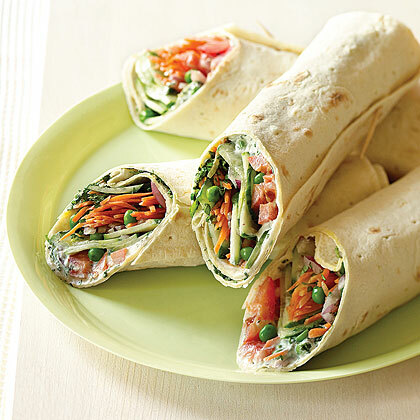 Fold 1 side of lavash over vegetables and roll up to meet other side. Secure with a few toothpicks, then cut in half. Repeat with remaining lavash and fillings.